Charlotte Lyons is an author, teacher, and artist based in southwestern Vermont. 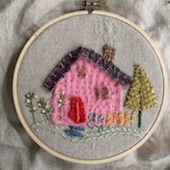 House Wren Studio is her creative home and a resource for makers and crafters around the world. © Charlotte Lyons 2006-2018, all rights reserved. Please do not use my images or writing without my permission. We're opening requests for the spots today for our next Vermont event this spring! June 1-4, 2017. Jenn McGlon from Noodle and Lou is our guest artist. If you are hoping to attend, just send us an email at fallvermontgetaway(at)gmail.com after 4 EST today. Do you want a private single room, a single bed in a double room or a single bed in the loft? Best to give us a variety of options. (Details are in the previous post.) We'd love to know if you want to come with a friend. Then we'll sort it out and contact you later this week. Thanks so much for all your support and interest!